The Notre Dame basketball team’s choice to wear green as hosts relegated Virginia to its white uniforms on Saturday afternoon. That turned out to be fitting because the Cavaliers wasted little time making themselves at home. 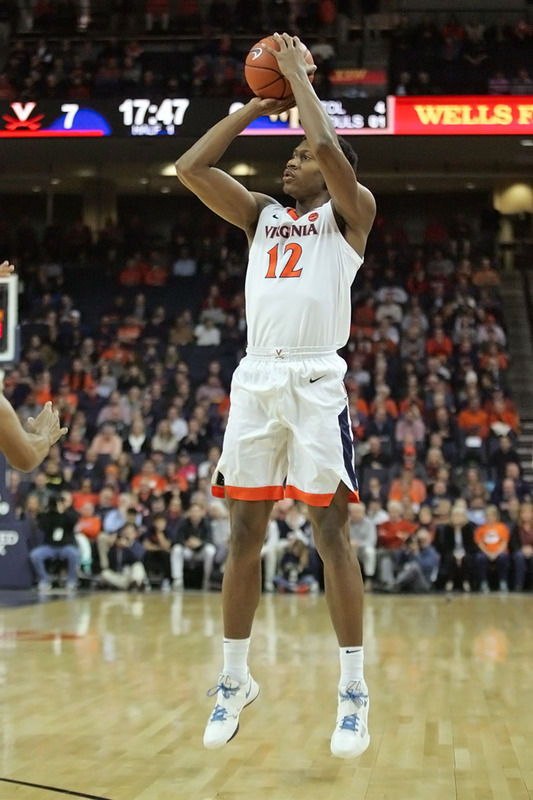 UVA jumped out to a 12-0 lead in the first 6:11 and took a double-digit lead for good before the 10:00 mark of the first half en route to an 82-55 victory. It’s the fifth time in six ACC wins this season that the Hoos have prevailed by 20 or more points. They’re 18-1 overall and 6-1 in league play with a trip to NC State up next on Tuesday. In what has become a pattern so far in conference play, this year’s Virginia team is ripping apart opponents with a lethal combination of offense and defense. Either one alone is hard enough to deal with when facing the Cavaliers, whose efficient style mentally and physically challenges foes, but when both are clicking, the task can be overwhelming for some teams. That’s what’s happened in the Hoos’ ACC wins so far and Saturday’s trip to Notre Dame proved no different. For the second straight game, Virginia placed five players in double figures for scoring. De’Andre Hunter led the way with 19 points to go with 7 rebounds and 2 assists. Kyle Guy added 15 points while missing just two shots to go with 5 rebounds. Ty Jerome followed that with 13 points, 6 assists, and 1 steal while also matching his career high with 9 rebounds. Kihei Clark came off the bench for a career-high 12 points, 1 assist, and 1 steal, while Mamadi Diakite stuffed the stat sheet with 10 points, 7 rebounds, and 4 blocked shots. That matched Diakite’s career bests for rebounds and blocks. Diakite jumpstarted the offense for the second time this week with 6 of his team’s first 8 points. Hunter then followed up with 6 of the team’s next 12 points to push the lead to 20-7 at the 10:13 mark. The closest the Fighting Irish got after that came with 13:27 to go in the second half with a brief flurry of 3-pointers, but Hunter and Jerome ignited a quick 8-0 response to put the game away for good. Unlike the Wake Forest game, the Hoos put up those scoring numbers with better than 50% shooting from the field. The visitors made 35 of 67 shots (52.2%) and 8 of 18 3-pointers (44.4%). Plus, they committed just two turnovers to tie the school record in that category. It simply was an efficient sandblasting of an overmatched ND team. As Brey alluded to during his time with the media, part of the energy-sapping issues came against Virginia’s defense. The Irish managed just 36.1% shooting overall (22 of 61) and 27.6% shooting from 3-point range (8 of 29). Of the 22 made shots in the game, 6 buckets came during the first 6:33 of the second half when Notre Dame closed the lead to 12 points at 54-42. That stretch included a trio of layups and a trio of 3-pointers as the ability to get to the rim on drives loosened up the perimeter momentarily. D.J. Harvey posted a layup, a 3-pointer, and two free throws during that mini-surge, while John Mooney knocked down triples on back-to-back possessions. That led Bennett to call for a timeout and he shifted personnel to get the more mobile Diakite on the floor to help with the perimeter in place of Jack Salt. That seemed to cool down the hosts and the offense’s response did the rest. Mooney finished with a team-high 15 points along with 10 rebounds. Harvey and T.J. Gibbs had 9 points each, while Dane Goodwin added 8 more. With a 5-1 record in true road games this season, Virginia gets another road test next on its schedule. The Cavaliers face NC State in Raleigh on Tuesday at 7 p.m.
Might want to correct Kyle’s points to 15. Thanks for the quick writeup. Always a fun read.